It was a festive atmosphere in the Kootenay Ice’s locker room following their 4-1 win in Red Deer on Friday night. A day before New Year’s Eve, the Ice already looked to have made a resolution to put in more a complete effort and rebounded nicely from their 4-1 loss in Lethbridge which had come just a day after beating the Hurricanes 6-4 in Cranbrook. The last time the Ice had played at the ENMAX Centrium in Red Deer, the Rebels handed them a 9-2 loss. On Friday, the team made it clear that would not be happening again. Kootenay drew a penalty off of Austin Glover — who was making his debut in a Rebels uniform after being traded from the Prince Albert Raiders — just a minute into the game. On the ensuing power play, Matt Alfaro ripped the puck top corner off of a broken one-time pass from Dallas Hines to take a 1-0 lead. 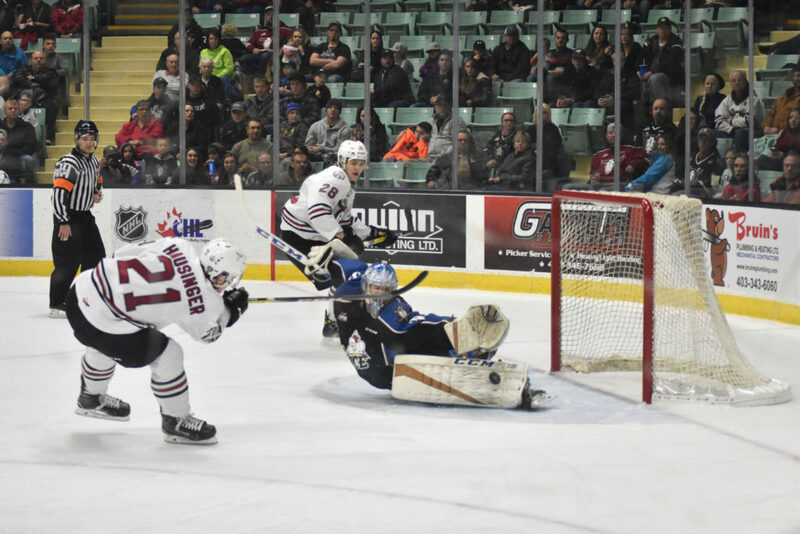 Alfaro had scored the lone goal in the Ice’s previous outing in Lethbridge and ended the Red Deer game with a streak of five points in the team’s last three games. Despite the early goal, the Ice didn’t dominate in the first period. It was a back-and-forth contest with plenty of opportunities including a pair of defensive miscues that led to a couple of two-on-zero chances for the Rebels. With eight minutes to go in the frame, Payton Lee made a dramatic pad save on Red Deer forward Cameron Hausinger to preserve their 1-0 lead. Hausinger had received a perfect cross-crease pass from linemate Dawson Martin but Lee stretched out for a game-saving stop. Minutes later, Brandon Hagel tried to cap off another two-on-none with Evan Polei feeding him, but Lee’s pad once again got in the way. Lee ended the game with 41 saves. With frustration mounting from the home side, Polei slashed Alfaro in the final seconds of the period earning a penalty on top of going into the intermission down a goal. Pierce described the start of the game as ‘the perfect storm’ for his side. Pierce was especially pleased with Alfaro’s early goal. In the second period however, the Rebels gained some life. Starting the frame at 4-on-4, Glover put a shot on Lee who gave up a big rebound and defenceman Troy Murray failed to pick up Brandon Hagel who tied the game for Red Deer just 40 seconds in. In the final frame, the Ice settled down their game and got key contributions from their stars and role players alike. Five minutes in, former-Rebel Ryan Pouliot walked into the attacking zone and was stapled along the side boards but managed to spring Noah Philp in front of the net. Philp put the puck in front and Murray pinched in to score his third goal of the year from the blue paint. After a penalty kill following a Barrett Sheen kneeing minor, leading scorer Zak Zborosky spun in front of the net for his 27th tally of the year. The night closed with Zborosky finding Vince Loschiavo to bury an empty-netter and picking up his third point of the game. “We weren’t very happy with how we were playing [after the second period],” Pierce said on seeing the contest through to the end. “I thought [Red Deer] played pretty well in the second and we got away from what we were trying to do. Beyond the obvious contributions from the team’s leaders — 20-year-olds Alfaro, Zborosky, and Lee were all outstanding — Pierce also pointed to a number of other players who stepped up to ensure the victory. “What’s given us fits against Red Deer all year has been their energy group and I thought that Max Patterson’s line with Tanner Sidaway and Austin Wellsby did a great job of countering that,” he said. “[They also] provided us with energy and were physical. After a week off for Christmas, the Ice now have another six-day break from game action. Their next contest is on Friday when they take on the Spokane Chiefs at home. The match is the first of three back-to-back which includes a home-and-home with the Chiefs and then the Vancouver Giants only visit to Cranbrook this season. While Pierce wishes the team could get in some games immediately to ride on their momentum of having won two of their last three, he also sees a week of practice as a good opportunity to get better. “I thought we’ve played well in all of our past three games [but] there are areas that we need to tidy up,” he said. “It’s unfortunate [that we don’t get to] play again right away because you’re feeling pretty good about your team, but it’ll be a good week for us. Puck drop against the Chiefs will be at 7 p.m on Friday at Western Financial Place.